I grew up surrounded by anger, which made me cringe inside. A lot. The angry undercurrents in my home created an insecure girl who longed for something different. Something as far away from anger as possible. I craved love. Yearned for it fiercely. But love seemed like a sparkly promise that always eluded my grasp, like dandelion fluff floating away on the breeze. I discovered that as I spent time with Him and meditated on Scripture, His love became more and more real, displacing my insecurities and filling my deepest yearnings. So the thing I once lacked began flowing abundantly in my heart and life. Like a fresh, beautiful rain shower that gently filled a once dry place. Only God can do such a thing! FREE PRINTABLE ~ If you, too, yearn for authentic love—love that never fails and that never stops—I have created a FREE printable featuring Scriptures on love just for you! To get your free printable, PLEASE CLICK HERE. 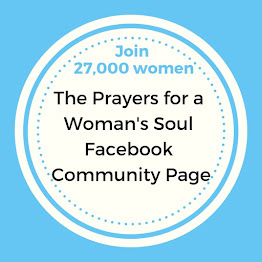 FREE CHAPTER ~ If you would like encouragement to pray for YOU, you can read Chapter One of Prayers for a Woman’s Soul for FREE! To get your free chapter, PLEASE CLICK HERE. Thank you for dropping by today. 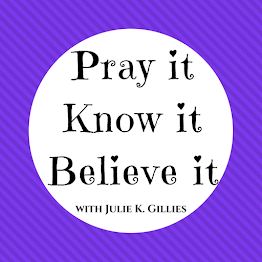 I pray that as you pour over scriptures on love, God's mighty love and His very real presence will flood your heart! 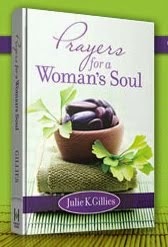 Thank you, Julie, for your devotional at Provebs31 and your resources here. I loved your turn of phrase "boulder of a lie". How true that felt to me a few years ago when I first began to question my image of God as an angry, punishing father expecting perfection 24/7. What a relief to begin to see Who God really is: a loving, forgiving, merciful, patient and giving Father. I know your words will touch many women's hearts and I've printed out your "Love Verses" to share with my daughter and her 11yo daughter. Great thoughts today -- I too, have had ah-ha moments recently where I recognize how my past impacts my view of God etc. 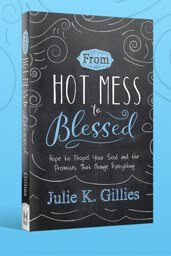 -- So thankful for His grace to help me process through the right lens . . . I appreciate your openness to share with us today -- it is encouraging to know others 'get us' and understand similar struggles -- Thank you for offering true hope in Jesus! Julie, thank you for these verses. I have had my 5 year old granddaughter for the past 4 years. Her mom is in the Navy and has done 2 back to back deployments so my husband and I have had her full time since Nov, 2010. She is really smart and learns very quickly so I have been able to teach her a lot of scripture. Her mother is taking her back to Washington to live in August and that is heavy on my heart right now. I'm in Texas, so she will be really far. This morning I was thinking about this situation and the thought came to me that I needed to focus on more verses to teach her that will assure her that God loves her. Then, I got your email so it was truly God's perfect timing. Thank you again for these verses - I will be a grandmother on a mission!! Please pray for me as I've lost my way and hope. I too grew up with an image of a fearful, angry God. This impacted a lot on my responses when I dated a Christian man. I put him through a lot of emotional turmoil through pushing him away, as I feared and saw in him, the forbidding God who would expect perfection 24/7. I was choked with panic but still very much in love with him and very much wanting to find true peace and faith - I could feel that real happiness but it would be overshadowed and choked out by the fear.He has now married someone else (who could blame him) There is not a day I don't think of him and can't help feeling God has let me down as I prayed incessantly or pushed me aside in impatience. I feel like trash. The church I used to attend became out of bounds as it's were my ex chose to start attending (prior to meeting his wife) Once he began dating her, e brought her there and I couldn't stand the pain, my own failure or any more turmoil. So I left. And since then, I know I have gone a long way back and just feel numb , pained and like utter trash who will never find a way and who only fails at life and even at accepting God.I realise this doesn't sound too positive...please pray if you can. My ex used to say God laid me on his heart. And that is how |I feel, even though I know he is now happily married and content,I feel he will be forever on my heart and it can't be moved. God placed him on my heart too and now there is nothing more.